In recent years, the overseas boom in Japanese cuisine has only picked up pace, with even France witnessing an increase in the number of Japanese restaurants located there. How do French people regard Japanese food culture? 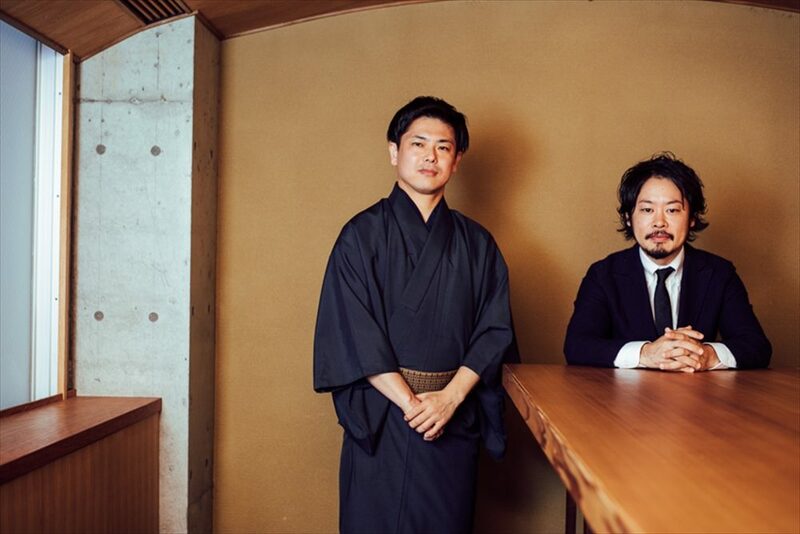 To answer that question, we interviewed the mixologist Shuzo Nagumo and the sake gastronomist Yusuke Miyashita—both of whom took part in the official program Japonismes 2018, a series of events that took place in Paris last year, divided into sections for discovering, considering, and learning about Japanese culinary culture—asking them about their reception in France as they carried out workshops, pairings, and the like to help the people of that country learn more deeply about the attractiveness and possibilities of Japanese tea and sake. ―Both of you participated in the Japanese Culinary Culture series in 2018. What exactly did you do while you were in France? Shuzo Nagumo: I traveled to Paris twice, my first visit having taken place in November to put on the “Japanese Tea workshop” (part of the Learning Japanese Culinary Culture series), in which I produced cocktails using Japanese tea to pair with the courses and deserts offered by Restaurant ES, which has earned one Michelin star. My second visit took place one month later, in December, when I gave a lecture entitled “The World of Japanese Tea” (part of the Considering Japanese Culinary Culture series), in which I talked about the new possibilities of enjoying tea. Yusuke Miyashita: I went to France in October 2018 to take part in the Sake Stroll in Paris (part of the Discovering Japanese Culinary Culture series), carrying out a hands-on workshop for various professionals, including wine journalists, prominent sommeliers, and local sake importers, pairing French food and Japanese sake. I also gave another workshop introducing sake to ordinary people. ―What was the reaction of the French people who attended your respective pairings? Miyashita: In my case, I used sake made by one of the brewers participating in the Sake Stroll in Paris. Also, I did not have any special dishes arranged, but instead used the regular dishes from the menus of the restaurants when I made my pairings. Though it’s true that there were a lot of restrictions, considering the situation we had of not having a wealth of sake options to choose from locally, I feel that our guests showed quite a lot of interest in my pairing methods. Those methods included demonstrating how the taste of the sake can be adjusted by changing the cup used, as well as changing the temperature of the sake by serving it from a heated okan or diluting it with water to adjust its tone. I believe that the most interesting pairing was the one I did with the dessert, which was named no-cheese cake with the sourness of yuzu citron fruit. Since it was a bit difficult to pair it with the sake that I had on hand, I resolved the situation by first heating the sake to 48 degrees C or so, in order to bring out its sweetness, then added a little cold sake, producing a layered drink with two different temperatures of liquid. By doing that, one could sense the original sweetness of the okan at the moment one drinks it, with a lingering aftertaste that is the clear sourness typical of cold sake, thus making it go well with the sweet-and-sour dessert. The expression of a certain sake can change quite significantly depending on how it is served, and I feel that the guests on the tour were able to get a good idea of the possibilities of pairings between French food and Japanese sake. Nagumo: The professionals who serve sake are indeed highly technical. The reason why people such as Mr. Miyashita can manipulate and play around with the flavor so freely is their technical abilities. Not only are they sake “selectors,” but also technicians. Be that as it may, wasn’t it quite hard to carry out a workshop on Japanese sake for French people, whose tastes typically center around a wine culture? Miyashita: It was just as you, Mr. Nagumo, have described: not easy at all. The level of interest in sake in Paris is extremely high, thanks in part to the increase in the number of Japanese restaurants there. The programs that we conducted were fully subscribed from almost the moment that applications started being accepted, and I hear that the waiting lists for them were long, too. Nevertheless, despite the strong interest shown in sake this time, sake has a long way to go to become an “everyday thing” in France. For that reason, in my workshop, I made sure to explain everything as logically as possible, altering the flow of the workshop a little from the way I do it in Japan, and mixing in references to the history and cultural background as well. A good example of that is the sake cup. Given that wine glasses are naturally the standard way to imbibe drinks in France, people there, without thinking much about it, feel a greater affinity to wine glasses than they do to Japanese sake cups. Because of that, I first showed my guests traditional sake cups, explaining to them the historical background, namely, that the Japanese have been drinking sake from cups shaped like that for more than one thousand years already. Also, I talked about it from the perspective of service methodology, telling them how it really makes sense to drink sake from sake cups when viewed from the aspect of taste as well. With that introduction, I got them to start really wanting to drink sake from sake cups, and when they actually did drink it, they noticed how delicious it was, and how its charm and attractiveness differ from those of wine. The same thing can be said for serving the sake hot. It would not do at all for me just to tell them, “You’ll understand once you drink it” or “You’ll understand if it’s good.” For people to accept a different culture, I think you first have to properly tell them what, how, and why it is different. Nagumo: People outside of Japan have different set of values and a sense of pride about drinks from those of Japanese people, so it’s very important to explain and relate things to them logically, right? Miyashita: Yes, you’ve hit the nail on the head. And I think that such logicalness is precisely what was most called for at the workshops we held in France this time. ―Mr. Nagumo, your attempt to make cocktails from Japanese tea must have been an extremely difficult endeavor. Nagumo: I have always believed that Japanese tea has great potential as a cocktail ingredient, so I had actually already been experimenting on the subject with Japanese tea experts in various trials since 2015. However, as far as making tea cocktails is concerned, it was imperative for me to create something that tasted better than using tea as the only ingredient. Unless it tastes good, there is no sense in making a cocktail in the first place, after all. What’s more, the term “Japanese tea” is quite broad, comprising a wide variety of types of tea. The way one brews tea depends on the type of tea leaves used. Moreover, part of the attraction of tea is the different tastes involved, such as its umami, sweetness and bitterness. I carried out quite a few attempts to produce cocktails that highlight those differences, but to tell the truth, half of them succeeded and half of them failed. For instance, teas whose flavor has a strong body, such as hojicha (roasted green tea) or genmaicha (tea made with roasted rice), enjoy an easy affinity with sake, but those teas that feature a more delicate flavor, such as sencha (green tea) or gyokuro (refined Japanese tea), are extremely difficult to transform into cocktails. Although I performed a wide range of trials, it was impossible in the end for me to express, in cocktail form, the optimum balance between umami and bitterness that is the hallmark of green tea. What I arrived at in the end was the method of soaking green tea in gin to produce a green-tea gin and tonic. The same thing happened with gyokuro. It is hard to reproduce the characteristic sharp sweetness of gyokuro in cocktail form, so after a repeated process of trial and error, I took the bold step of increasing the amount of gyokuro when distilling it together with vodka; it was only then that I was able to extract the unique flavor and taste of the gyokuro. The result of that was the gyokuro martini, which I also now offer at the Mixology Salon. While there were a lot of challenges experienced, I wanted to propose a new method of enjoying tea that could be enjoyed as a cocktail. Miyashita: I myself visited your Mixology Salon the other day and tried out the gyokuro martini, and was really surprised by the perfection of its taste. Not only does it completely reflect and reveal gyokuro’s best features, but the drink is also quite delicious as a cocktail. Various elements are blended together into a whole, and I got the impression of tasting a single menu offering. Mr. Nagumo, what were you thinking when you came up with the different cocktails on the menu at the Mixology Salon? Nagumo: I believed that three elements were necessary to come up with cocktails using tea. The first was producing the tea version of classic cocktails. Examples of that include the green-tea gin and tonic and the gyokuro martini that I just mentioned. The second element, then, was to be a little more creative. That means making cocktails as a combination of interesting tastes, similar to contemporary artworks that are made up of various elements painted atop of another, such as oil paintings. The third was to make the cocktails with tea that has been freshly brewed. As the body of such tea is weak, its flavor tends to get swamped by the alcohol mixed with it. In addition, green tea holds up poorly against acid, so adding acid will wreck the balance of the round sweetness of the theanine found within the tea. After verifying those kinds of things one by one, I was able to come up with cocktails that achieved a harmony between the acid and the sweetness of the theanine. Miyashita: I see. Sure enough, those three elements were brilliantly expressed in the cocktails, making each glass a new discovery. Nagumo: Whether or not cocktails could be made with freshly-brewed tea: being able to do so, I determined, would allow the goodness of sencha (green tea) to emerge. Still, regrettably, actually carrying that out was a difficult task. Simply mixing freshly-brewed tea with gin would not be so interesting, so I thought, what could be added extra, in a multiple fashion, to create a new form of sencha? Sencha tea-tail I introduced at Paris this time was also the result of my having conducted various tests on different combinations, adjusting things down to the last milliliter. It was not until all three elements were present that I was able to create the world view of a new kind of cocktail that was neither tea nor alcohol. I am now working to push the concept even further. Miyashita: That take on cocktails is quite interesting. In fact, the idea of enjoying sake in a cocktail-like fashion by adding something to it has been around for a long time. One example of that is toso, or New Year’s spiced ceremonial sake. Toso was originally a kind of medicinal sake that was drunk after being pickled in a type of Chinese herbal medicine called tososan. There is also the ayamezake or shobuzake (sake mixed with ground iris roots) drunk during the May 5 Tango no Sekku (Boy’s Festival), and the chrysanthemum sake drunk during the September 9 Choyo no Sekku Festival, to mention a few. I think it would be interesting to reinterpret all those traditional drinks as “cocktails.” At the Fushikino restaurant, also, we adjust the tone of the sake we serve through the addition of not just regular still water but also sparkling water and gyokuro, both of which we always keep on hand. By diluting sake with sparkling water, the acidity of the entire sake is lifted up and removed by the carbonation, which clearly produces a firmer taste than does sake diluted with just still water. Also, diluting the sake with cold-brewed gyokuro allows the original sweetness of the latter to complement that of the former. In that way, how one dilutes the sake depends on one’s purpose. I think that leads to the idea of regarding sake itself as a kind of dish or cuisine—in other words, moving it into the realm, to be precise, of the cocktail. Nagumo: The culture of Japanese tea and sake is truly profound. For some like you, Mr. Miyashita, it is possible to pursue a single theme ever more deeply, while in the case of my cocktails, for example, it is also possible to propose new world views. It would be wonderful to help spread the profundity of Japanese culture in that manner overseas. In that respect, I believe that getting the participants to enjoy Japanese tea and sake through the Japonismes 2018 project in France this time was highly significant. 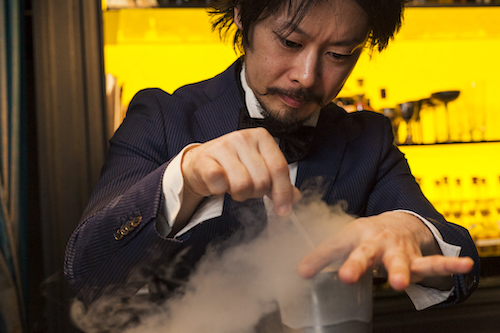 One of Japan’s top mixologists, skillfully utilizing state-of-the-art technology and equipment to invent new cocktails that have never existed before. 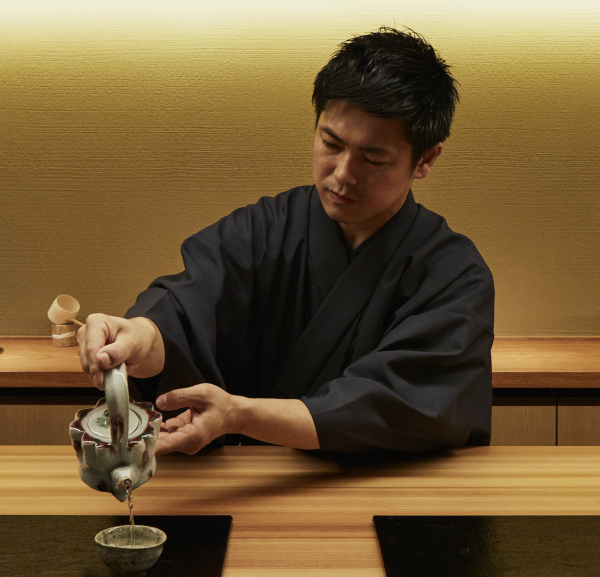 In April 2017, Nagumo opened the Mixology Salon in the Ginza Six building in Tokyo as a new type of establishment based on the concept of tea and cocktails. In November 2018, he opened Mixology Spirits Bang (k) in Ginza Plus Tokyo as a bar specializing in cocktails using domestic spirits. Currently he runs six bars in Tokyo. He has also expanded his activities to include consulting services for promotional projects organized by manufacturers, the development of menus for major foreign-run hotels in Japan, consulting services for product development to major foreign liquor brands, and cocktail catering to parties held by various organizations and firms. His variegated efforts also include invitations to serve as guest bartender and lecturer worldwide, running several cocktail seminars abroad, primarily in Asia. Miyashita was the youngest finalist in the Second World Sake Sommelier Competition that took place in 2006. Since then, he has held many seminars on sake and sake utensils in various places. In 2011, he opened the Japanese restaurant Fushikino in Tokyo, specializing in sake pairing. So far, he has provided pairings to more than ten thousand people, and has developed an original theory about serving sake. He currently serves as a sake ambassador, traveling around Japan and various countries worldwide to hold sake pairing events, having been invited to hold seminars as a lecturer on sake and sake utensils.